Molly Brewer scored in the 60th, from Emilee Williams corner, to finish the match tonight. A subdued celebration, including cake for the players and fans, as the team is focused on post-season success. Team photo will follow. 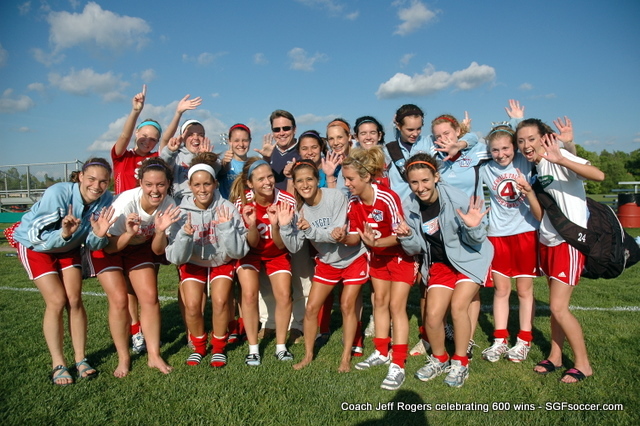 Less than three years ago we visited with Jeff as he earned his 500th victory. He hit the milestone on Tuesday September 4th 2007 when the Falcons defeated the visiting Waynesville Tigers by the score of 4-0. Jeff’s record at that time included 15 district championships, 14 conference championships, 10 quarterfinal appearances and two visits to the Final Four. In the five seasons since he’s added a pair of Boy’s District titles (2007, 2008), and his 2008 squad went on to reach the State Final, losing to Rockhurst in the Final. He also had four different players earn All-State honors in that time period – Devon Newport (2007, 2008), Ryan Squires and Graham Basecke (	2008) and Jordan Pitts (2009). On the Girls side, a District win in 2008 with a quarterfinal loss to Incarnate Word was followed by the run to the Final 4 in 2009. Girls winning All-State honors include Lorin Opfer in 2008 and Molly Brewer, Emily Jordan and Lindsey Sprouse in 2009. It was the girls program first ever trip to the Final 4, to go with three trips for the boys. Great job, Jeff. Keep it up!